Son of Rev. E.F. Reade. A donation to the memorial statue has been made in honour of this soldier by Tim and Louisa Henderson. Charlton Leverton Ridout Reade was the only son of Rev. Edward Frank Reade M.A. and Mary Macleod Reade. He was born at East London, Cape Colony, S. Africa, on November 7th, 1897; and came to England in August, 1898. He was educated at "Belmont" (Mr. G.L. Evans), Brighton, and Brighton College; whence he passed into Sandhurst in August, 1915. 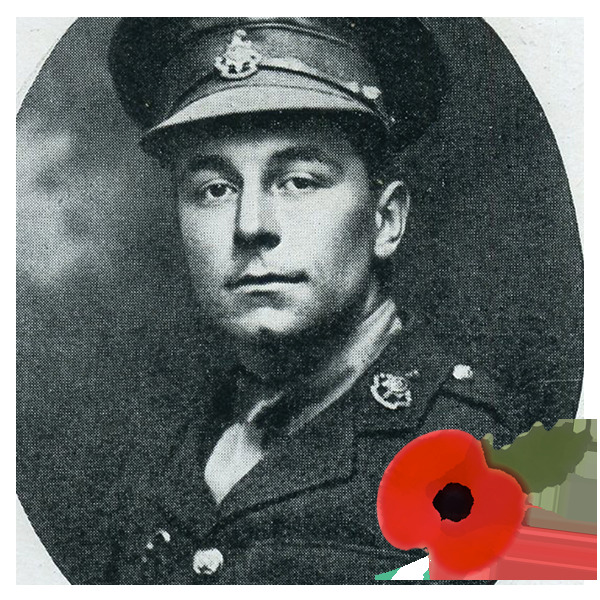 On April 6th, 1916, he was gazetted to the Royal Sussex Regiment, which he joined at Newhaven. He had a month at the Pioneering Camp at Wigan, and qualified as a Pioneering Officer. On Monday, August 28th he left for France, and reached the front at the end of the same week, and was killed in action on September 9th, Saturday. On that Saturday the Royal Sussex Regiment was called upon to make another effort. Their trenches were to the right of High Wood; the battalion was to attack in three waves at 5 o'clock on the Saturday afternoon. Second Lieutenant C.L.R. Reade went over with the first wave, and fell at Wood Lane, where the Regiment has erected a cross over his grave. The Colonel writes:- "It will, I know, be some comfort to you that your son and others did not die in vain and the Royal Sussex added to their name, and were completely successful. Your boy, and twelve others, had only been with us a week, when we were again called upon to do our best, and the success we achieved was largely owing to the stout leading way of their new young officers. Your boy was killed by a bullet, and did not suffer." The Chaplain wrote, "Though he had been so short a time with the Regiment, he had already impressed his brother officers with his splendid courage." Reade was born in November 1897 in East London, Cape Colony, South Africa but within three years his family had returned to England and was living in Whitefield, Kent with his parents and a younger sister. His father was a relatively young clergyman named Edward Reade and it can be surmised that he had previously been a missionary in South Africa before the family returned to England, possibly because of the disruption and danger caused by the Boer War. The 1911 Census reveals that the family, now with a maid servant aged 18, had moved to 19 College Road in very close proximity to the school. As might be expected Charlton Reade was enrolled in Brighton College as a day boy member of Hampden House but not until 1913 when he was 16. His school career appears to have been undistinguished but he left, evidently to undergo officer training, in 1915 aged 18. The London Gazette then records that he was commissioned as Second Lieutenant in the Sussex Regiment on 6th April 1916. ‘Charlton Ridout Reade, Dearly loved son of Edward Frank and Mary Macleod and brother of Leily. Believed to be buried in this cemetery’. It is clear therefore that Charlton Reade’s body was never actually formally identified and that he was probably interred in a mass grave. So stricken where his parents by grief that they evidently took the unusual step of erecting their own memorial to his death in situ rather than relying on the headstones provided by the Commonwealth War Graves commission. Charlton Reade’s sister Leily was again bereaved by war 25 years later when her husband, whom she married in 1929, died of wounds in East Africa in March 1941. She herself died as recently as 1995 in Dyfed, Wales.